This post contains some pressing principles employed by the Arkansas mens program. Adjust these to fit your players and philosophy and/or take bits and pieces to combine with what you already run. 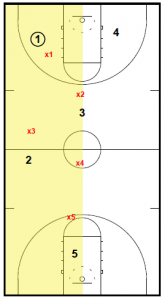 The diagrams and notes are from the “Full Court Pressing Defenses Playbook” assembled by Chris Filios. It is paired with the Houston Rockets Playbook (also written by Coach Filios) as this week’s 2 eBook special. 1. Don’t gamble- be fundamental and disciplined. Let the opponent make the mistake. Making a play on the ball with a small chance of success will put you/defense out of position and give advantage to the offense. 2. 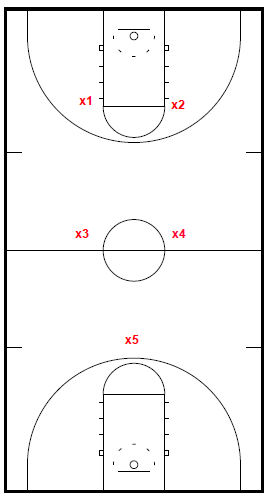 Eliminate the forward pass to the middle of the floor- the middle of the floor should always be covered. Defenders should never leave unless a teammate has rotated to cover. 3. Be active! Be pro-active and anticipate. Don’t be reactive. Jump and rotate hard to the ball. Communicate loud and often. Give high effort. 4. Eliminate bad fouls- when trapping, don’t reach! It is not your job to get a steal while on the ball. Establish good positing with feet and hands with great activity. 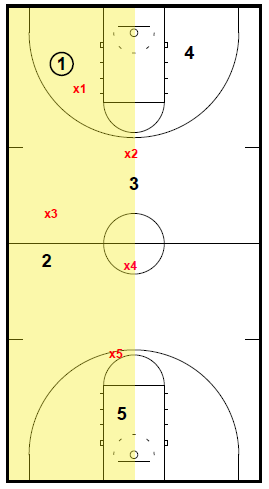 x1-the player defending the ball (x1) forces the ball handler down the sideline alley. He must not get beat to the middle of the floor. x2-the guard opposite the ball defends the pass to the middle of the floor. x3-the ball side forward is in a ball-you-man position, ready to trap near half court when the ball is advanced in the sideline alley. x4- moves to the middle of the floor. Helps pinch with guard on any offensive player in middle. Also prepared to rotate to basket. x5- basket protector. Will rotate out to sideline if there is a trap. All 5 players are in the “box” (same side of the floor).